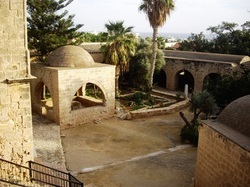 Ayia Napa has a long but until recently, fairly quiet history. In fact before 1800 the only building was the Venetian monastery which still stands next to the bars and clubs of the central square. From 1800 until 1974 the small village was home to few people, mostly fishermen and farmers. Following the Turkish invasion of 1974 refugees from the Famagusta area boosted the population and began to develop the town into the popular tourist centre it is today. By the mid 1980's Ayia Napa had earned itself a name as a hotspot for the younger crowd with more than 10 nightclubs and over 50 bars. During the 1990's Ayia Napa cemented it's reputation with more bars and clubs opening all over the town which rapidly spread from the centre for several kilometres alongside the stunning unspoilt beaches. Today Ayia Napa has mellowed a little and whilst still very popular with urban music lovers, especially during July and August, it now offers something for pretty much every taste in music, from House, Dubstep, RnB and cheesy tunes right through to rock and live indie music. Families are now also catered for with numerous bars offering child friendly entertainment. Whilst the loud themed bars around the central square are still present and busy as ever, a new crop of trendy lounge bars have also sprung up for the more sophisticated and grown up night out. Luckily Ayia Napa has retained it's village feel and whilst being thronged with thousands of holidaymakers in the summer it remains one of the safest places to holiday in the Mediterranean. With a very low crime rate, especially against tourists and very friendly local people many visitors from around the world have fallen in love with Ayia Napa and return year after year, some even settling here permanently. So where is Ayia Napa exactly......? Cyprus lies at the Eastern end of the Mediterranean sea with Egypt to the South, the Leventine countries of Isreal, Jordan and Syria to the East and Turkey to the North. Ayia Napa is pretty much the most Easterly point of the European Union with a 4-5 hour flying time from North and Western European Countries and 2 hours from Central and Eastern Europe. The nearest airport to Ayia Napa is Larnaca which is around 45 kilometres away. The closest towns to Ayia Napa are Protaras which is aproximately 8km East along the coast and is another popular holiday resort, and Paralimni which is aprox 10km inland and is a modern Cypriot town with plenty of shops and businesses. Next is Macronissos which is aprox 6 km from the centre of Ayia Napa. A handful of bars and restaurants line the main road here with a choice of good standard resort hotels and small self catering complexes. There are several good sandy beaches here. Landa or Golden beach is right next door to Macronissos and is a nice sandy beach. The most famous beach area in Ayia Napa is Nissi Bay, 4km from the town centre, and is sometimes called a resort in itself, encompassing the beaches and areas of Macronnisos, Landa, Nissi and Sandy Bay. Nissi Beach is long and sandy with an island which can be walked to at low tide. Watersports, snack bars and plenty of facilities can be found plus daily DJ's and parties take place at one end of the beach during the summer. Sandy Bay or Vathia Gonia is a lovely sheltered beach which is slightly quieter than it's neighbour. It is popular with families and snorkelling enthusiasts and has a nice selection of hotels, shops and low key nightlife. Continuing towards the centre of Ayia Napa along Nissi Avenue there is a cycle path along the road or a seafront path which takes in small sandy beaches and rock pools. After around 2 km of hotels, shops, bars and restaurants, the traffic lights announce you've arrived at the centre of town. From here the harbour is just a few minutes walk and in the opposite direction is the the monastery, the church and the main square, this is where most of the nightlife is situated. From the harbour Eastwards towards Cape Greco is another long sandy beach called Grecian Bay, which is lined with more large hotels. Another coastal path leads walkers past the edge of Ayia Napa and several tiny beaches towards Cape Greco national park.